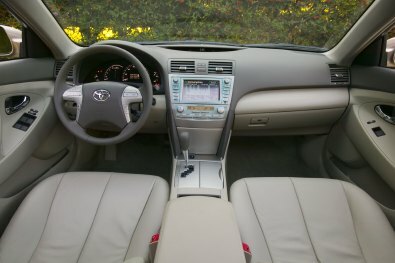 Toyota American senior vice president Don Esmond introduced the 2007 Camry by emphasizing the car's feel-good features, like something called Sericin (not to be confused with Serin, which kills almost instantly), and an HVAC system that filters out fungus, odors and other allergens. Extracted from silkworm cocoons, Sericin is a fabric coating that moisturizes and prevents chafing (hubba hubba). As for the Camry Hybrid — the major news of the day — it'll sport a new, 2.4-liter gas-electric mill producing 195 hp — equal to the current 3.0-liter V6 — and 138 lb-ft of torque. Fuel efficiency numbers are a respectable 43 mpg city /37 mpg highway. Click for more pics.